ISCHIA AND THE HOTEL MEZZATORRE – WHAT IS JAMES WEARING? I’ve often wondered what Ischia, Capri’s sister island was like, and having heard and read some pretty amazing things about it, we finally went. Of course the place comes with some pretty stellar references (understatement), having seen the likes of Elizabeth Taylor, Jude Law, Gweneth Paltrow, Clark Gable and Prince Charles, to name a tiny handful of its visitors. Mcbee and I were struck quite immediately by the peaceful energy of the place. 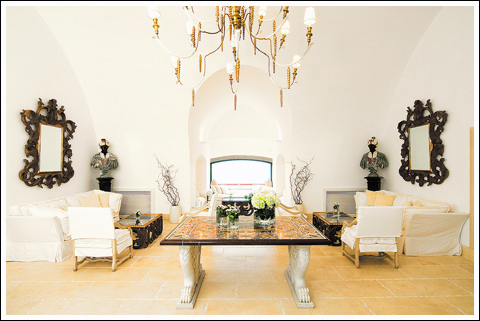 It’s an absolutely stunning island, reminiscent of Capri, but quite a bit larger, and Hotel Mezzatorre turned out to be the perfect base from which to discover Ischia. Once the private home of a Count, the magnificent hotel and spa is perched on a bluff surrounded by lush mediterranean gardens and offers the most spectacular views of the sea., (and as it turns out, we very happily were upgraded to a stunning eclectic modernist suite with a beautiful private balcony!). Oh, and the treatments at their spa are a must if you are interested in experience some of the extraordinary healing benefits of Ischia’s thermal waters. I suggest the thermal mud wrap, followed by “Balneotherapy” which begins in a thermal pool equipped with six very powerful targeted jets that massage away every bit of stress. End with a bit of “Kneipp Therapy” which entails walking for fifteen minutes around two tubs—one with hot thermal water and the other with ice cold water. Smooth stones underfoot improve circulation and tone one’s legs. It’s absolutely the way to ready oneself for any adventure in Ischia. With only two days in Ischia we decided to mostly relax, unwind and enjoy the beauty of the Mezzatorre, though we did manage to squeeze in a few sights which we will go on about a bit more in our next post! The Mezzatorre has its own little version of a La Fontelina beach club as well as a pool and restaurant called Sciue Sciue serving the most delicious traditional Neopolitan cuisine—some of the best food I had on this holiday was at the Mezzatorre’s restaurants. We had dinner at their Chandelier restaurant located on a cliff-top terrace with the most sensational views of the sea. With a sophisticated take on Mediterranean cuisine accompanied by a wonderful wine selection and perfect service, the Chandelier made for a remarkable dining experience. Needless to say I am quite baffled that I had waited so long to experience this place and a bit saddened that we had only booked two days there! 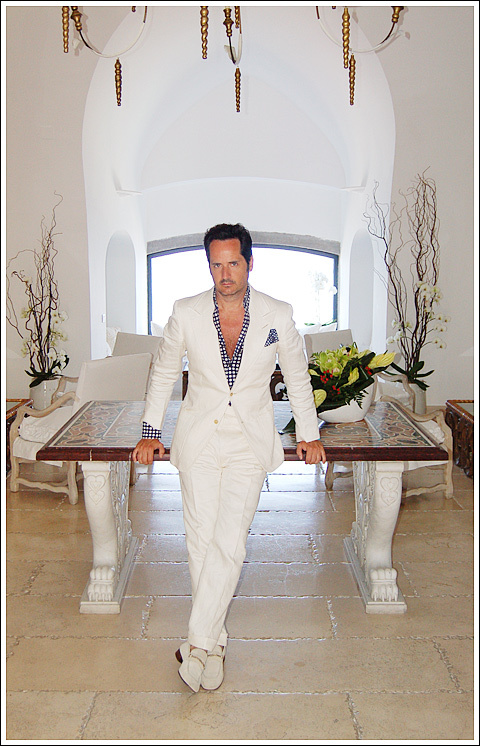 Pictured in the Mezzatorre elegant sitting room before heading to a delightful dinner, I’m wearing a Tom Ford ivory linen sateen suit, navy and white dot print shirt, royal blue silk dot print pocket square and Ivory suede loafers, vintage Rolex watch and my fragrance is Tom Ford Neroli Portofino. Posted in: Random, Rolex, Tom Ford. You look great in your white suit, Dear James, just like “the Great Gatsby”. Have a good time over there in ischia!!! 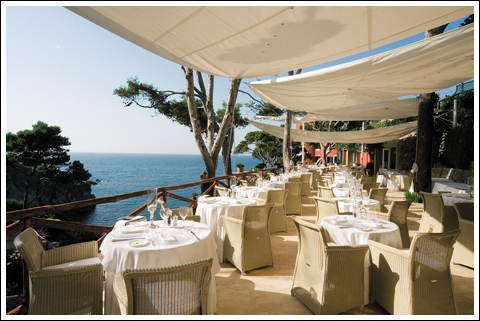 From what I’ve read, Ischia is a more exclusive version of Capri- was this your impression too? This portrait of you is so amazing- it would be great for the cover of your own interior design book, when you do it! Thanks for this super chic inspiration. Fabulous Hotel…wish we were there! Love the check shirt and white suit! Always so wonderful to be compared to “The Great Gatsby”! Que moreno y que guapo estás! Me encanta el traje blanco y la camisa de Tom Ford! Me chifla Tom Ford!!! Both are must see places- simply sublime! Love the facial hair. You look great in this photo. Tan, unbuttoned shirt, slightly tousled hair… sprezzatura!